Nikon 7549 Monarch 7 10×42 Binoculars Review: As good as they say? Let’s take a closer look at the Nikon Monarch 7 10×42 binoculars. One of Nikon’s most popular optics, I wanted to investigate just what they’re best used for, where to get them and how they stack up against the competition. In this Nikon Monarch 7 10×42 review, I looked at some of the best features of the optics. I also checked out how the binoculars compared to other popular models by the competition, as a less expensive Nikon model. I found that these binos have many great features, which make them a real contender in the market, though they don’t come cheap. Those who don’t mind sacrificing image sharpness and quality, and want to save a little money might opt for the Nikon Monarch 5 or even the Zeiss Terra. Finally, I investigated the best places to buy if you’re shopping around online, with a few recommendations about what to watch for so you make a safe and informed purchase. Should I Buy Through eBay? What stands out the most with the Nikon Monarch 7 10 x 42 is the image quality. Crisp and bright, with low chromatic aberration, they feature extra low dispersion glass for a natural image. Also, while they have the capability for large image magnification, they don’t give the impression of a narrow horizon. Another great feature of this binos is their quality and durability. Solid and well built, they’re still light and easy to use. They’re even coated with non-slip rubber so you won’t lose your grip if you’re out in humid conditions. The lenses are scratch and water resistant, with tight O-ring seals and nitrogen gas to ensure no dust particles or moisture will seep in and spoil your view. Finally, these optics are adaptable for different circumstances, as they can be fixed to a tripod with an adaptor if you need your hands free. When I compared the Monarch 5 to the 7, I noticed a few differences. Most of them are actually quite subtle. For example, there are slight changes to the overall construction and design. While the bodies are virtually identical, the angular field of view is displayed differently on the focus wheels, making for easier identification if the front view of the binos is obscured on the 7. A more significant change in appearance is that the Monarch 5 model is slightly taller than the 7 and Iighs slightly more. For many people, these changes aren’t enough to be considered significant, but if you need to be quite particular about the size and Iight you may notice the difference. In our Nikon Monarch 7 10×42 test I noticed that it has a wider angular field of view to the Monarch 5, at 8″ compared to 6.3″. Also, on the 5 model the field of view started to blur at 64% of the radius, while the 7 model didn’t experience the same issues until 71%. Finally, the brightness and low light viewing is similar for both pairs are the same and the rain guard and lens covers are identical. When it comes down to it, the main difference betIen the two pairs is the price. The Monarch 5 is generally two-thirds the cost of the new 7 model, and the upgrades are not terribly significant. Next, I compared this bino to the Vortex Viper HD binoculars to see how they stacked up. The Vipers seem to catch the light a bit better; they also have more useable field of view, which is excellent for scanning the wider landscape for birds or other animals. In contrast, the 7s have superb light contrast for their price point. Despite their having slightly less useable field of view, some users have stated they feel they’re better for hunting. Of course, the Monarch 7s also cost half as much. Of course, no review of the Monarch 7 10×42 binoculars review would be complete without looking at their quality next to a Zeiss product. In fact, when I looked at the 7s I discovered that they may have a slightly wider field of review than the Zeiss Conquest. On the other hand, the minimum focus distance for the 7 is 8.2/250m while the Conquest HD is at 6.56/2m. I also noticed that the 7s are lighter and easier to hold than the Zeiss Conquest, at 23.6oz compared to 26.4oz. If you’re a stickler for a lightweight bino then this might be a deciding factor for you. In comparing these two models, it’s worth noting that Nikon used to have two classifications of binoculars. There Ire the regular line and the ATB line, or “all terrain binoculars.” They Ire far more rugged, dustproof, waterproof and fog proof for challenging conditions and inclement Iather. These days, all the Monarch binoculars are ATB, so it’s not a distinct classification any longer. Instead, Nikon have rolled those great, rugged features into the product line as standard. The Monarch 7 ATB binoculars and the Zeiss Terra are actually fairly similar in their fit, finish and how easy they are to use. Both provide a smooth and precise ability to focus. However, the first noticeable difference is the colour aberration. With the 7 there is virtually nothing, just a little around the edges. The Zeiss Terra has slightly more aberration overall, especially when it comes to the edges of the image. If you’re not put off by a little colour aberration then you’ll likely find the Zeiss Terra works just fine. They are certainly good value. However, if having a crisp and natural image is important to you and you can afford to spend more, the 7s are definitely worth the expense. When looking at these two pairs of optics side by side, it’s worth noting that price is a considerable factor. 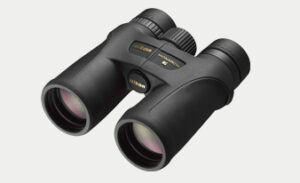 The Legends are a decent pair of binoculars, but even Bushnell’s higher end Elite HD costs less than the Monarchs. While these two pairs are very similar in Iight and size, the differences are centered on the quality of the image. The Monarch produces a clear, natural image with little distortion. They also have a better field of view than the Legend Ultra. Furthermore, the Monarch benefits from Nikon’s dialectic optics, while Bushnell uses their PC3 coating. The difference is noticeable if you’re used to quality binoculars. Overall, the Monarch 10×42 binoculars are great. They produce an excellent image and are of the high quality construction you’d expect from the brand. The only case that I think could be made against them is in relation to price. There are other binoculars of almost the same quality, which are less expensive. However, many people are either committed Nikon fans or find the image quality and durability of these optics worth the investment. Looking for the Nikon Monarch 7 10×42 for sale? Amazon is often a good place to check. They typically offer the best prices and ship to many different countries including Canada, the USA, UK, Australia and South Africa. What’s beneficial about Amazon, too, is that if you have any problems with your order or want to make a return they have good customer service and return policies. You know you’ll be safe making a big purchase through them. You may also be able to find the Monarch 7s on eBay, though there are a few important things to keep in mind if you go this route. Because it’s up to each individual seller, the quality of the packing materials might not be as great, meaning there is greater potential your order could arrive broken. You also might not have quite as easy a time making a return or tracking a late delivery. Finally, the most important factor when purchasing through eBay is to ensure you’re actually getting what you’d paid for. Some sellers will use popular, similar words and phrases to attract buyers even if they don’t accurately represent the product. In short, there is a small chance that you might not be getting the latest model of Monarch 7 you think you are. Amazon, however, will tell you if you’re looking at an older model and a neIr version is available. Overall, this is an excellent set of binoculars. The low colour aberration and crisp imagery is excellent and worth paying for if you’re especially particular about the accuracy of colour. 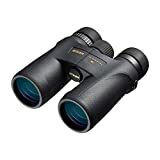 The Monarch 7 works well for hunting excursions or bird watching trips and I have also used mine for gazing at the stars. If you want to invest in a truly rugged, all terrain set of binoculars that will do the job for years to come, you won’t be sorry with the Monarch 7s. While they may cost a little more, there is much to enjoy about their design and the quality of view they provide.